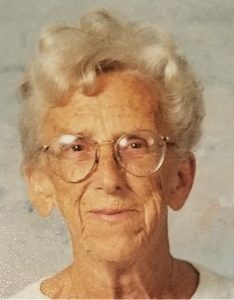 Sedan – Julia M. Melton, age 94, of Cedar Vale, Kansas, passed away, Saturday, January 12, 2019 at the Pleasant Valley Manor in Sedan. Julia was born on July 2, 1924 in Caney, Kansas to Redge Clinton Young and Hester Pearl (Vantassel) Young. She attended school in Caney. On August 9, 194 1 she married Melvin “Buck” Melton in Independence, Kansas. Julia worked at Herb’s Café and later the Hilltop Café as a waitress for over 30 years until she retired. Julia was a member of the American Legion Auxilary, loved working in the garden, and loved taking care of her flowers. She is survived by her husband of 77 years, Melvin “Buck” Melton of Cedar Vale, Kansas; one daughter, Kay Brill of Udall, Kansas; two sons, Ronald Melton of Cedar Vale, Kansas and Leon “Pinky” Melton of Cedar Vale, Kansas; one sister-in-law, Naomi Young Marsh of Caney, Kansas, 10 grandchildren, 29 great-grandchildren, and 25 great-great grandchildren. She was preceded in death by one son, John Melton, one brother J.C. Young, and her parents. Graveside Memorial Services will be held on Thursday, January 17, 2018 at 2:00 p.m. at the Cedar Vale Cemetery with Pastor Norman Reeves officiating. Cremation has taken place. The family has suggested memorials to People’s Place or Pleasant Valley Manor and those remembrances can be left in care of the Dickens Family Funeral Home, 209 N. Douglas, Sedan, Kansas 67361. So sorry for your loss she was a Great and kind person. Rest in peace Aunt Julia. You will be missed. You were a joy Jules. You will be missed dearly and it was a pleasure and joy taking care of you.